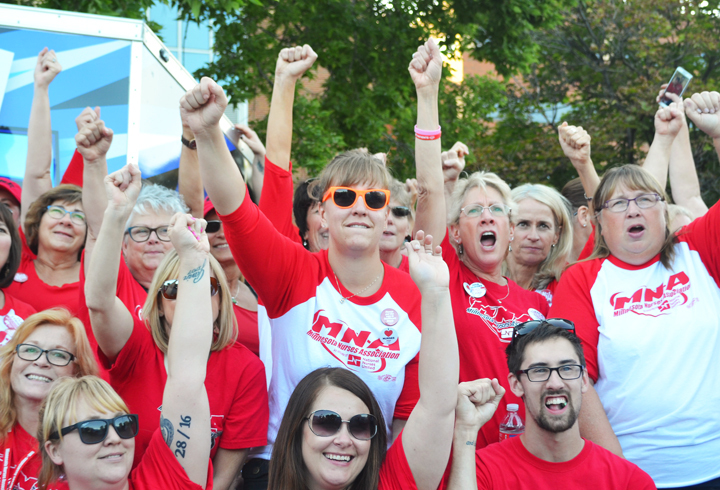 Allina nurses rallied with RNs from other Twin Cities hospitals and supporters across the labor community Thursday in Minneapolis. Last-ditch talks between Allina nurses and management broke off early this morning after a marathon, 22-hour negotiating session failed to yield agreement on a new contract. As a result, nearly 5,000 members of the Minnesota Nurses Association plan to begin an open-ended strike Monday morning. Join nurses on the picket lines. Sign up for a shift at allinastrike.com. Donate to the nurses’ strike fund. Allina has already spent more fighting nurses than the $10 million it’s seeking to save annually by eliminating their insurance. To stand up to Allina and stay on the picket lines, nurses and their families will need financial support. Donate at mnnurses.org/donatestrikefund. Send food, drink and other necessities to the picket lines. MNA’s point person coordinating food donations during the strike is Geri Katz. Contact her at 651-252-5510 to direct your contribution where it’s needed most. Call out Allina and its corporate leadership. Take action online by tagging Allina at @allinahealth and using the hashtags #MN4RNs, #nursesneedcare2, #allinacuts and #1u. Also, use the list below to contact members of Allina’s not-for-profit board of directors, by phone or e-mail. Nurses and supporters signed onto an appeal for Allina to reach an agreement that works for both sides, but security at Allina’s corporate headquarters refused to allow delivery. 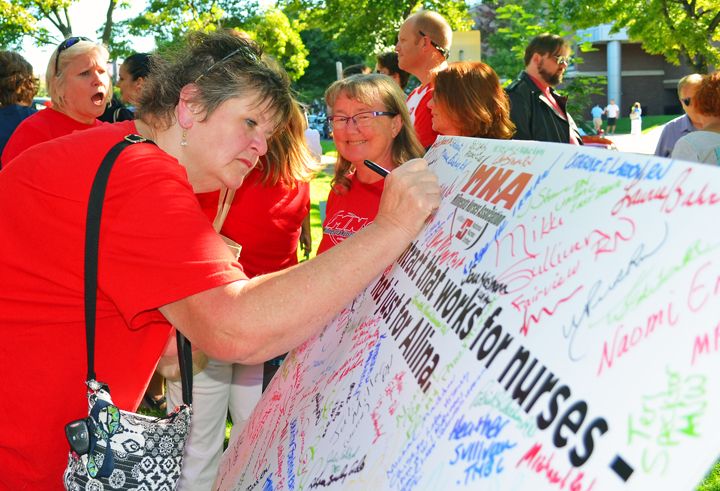 At a rally earlier this week, nurses from other Twin Cities hospitals pledged solidarity with their Allina colleagues for as long as it takes to get the contract they deserve. “We’ll be on the line with you through thick and thin,” Methodist nurse Mary McGibbon said. 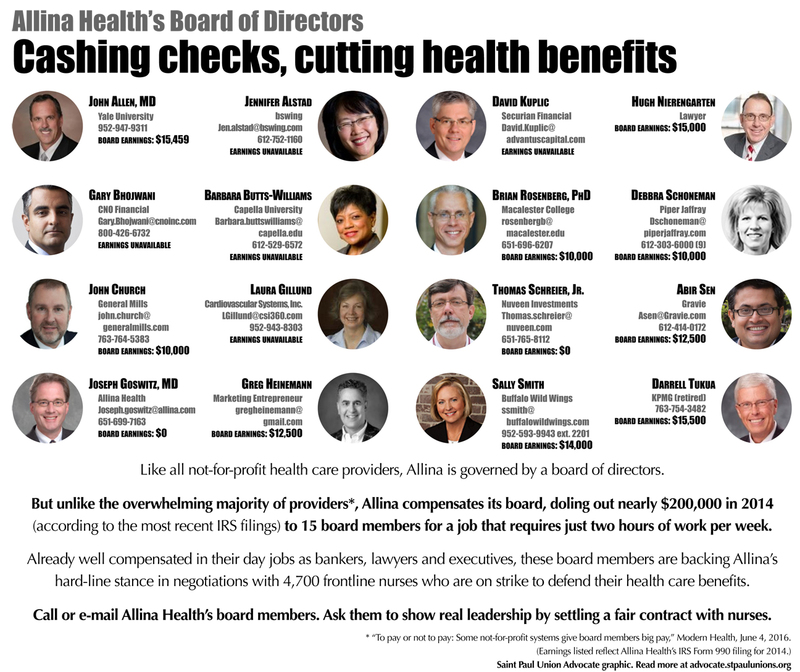 In addition to support from other nurses, several large Minnesota unions, including SEIU Healthcare, AFSCME Council 5 and Education Minnesota, have delivered notice to Allina Health that their members intend to picket alongside MNA members. MNA is encouraging supporters to take selfies with nurses and post them on social media using the hashtag #MN4RNs. Pictured are nurses Nancy Jahnke of Mercy Hospital and Kimberly Blomberg (R) of Abbott Northwestern. Peter Kaiser, a member of SEIU Healthcare Minnesota who works as a janitor at Unity Hospital, said Allina employees are behind MNA nurses. “We’re all here together to shout with one voice,” he said. Allina management and nurses made some progress during the 22 hours they spent in negotiations, according to a press release issued by MNA today. Allina gave some ground on nurses’ demand for security officers in emergency rooms, but the provider refused to budge from its demand nurses give up their union-sponsored, low-cost health insurance plans before 2020. The sticking point, according to nurses, remains Allina’s refusal to give them a safety net against high-cost medical bills, as well as management’s demand for language allowing Allina to change health care plans without bargaining with nurses again. Good luck! How can a hospital take away healthcare from its nurses? They are shameless. Thank you for supporting this labor fight against corporate healthcare greed! An injury to one is an injury to all……. From a dedicated RN , United Hospital.